Sustainability is a top priority for Metaxa Hospitality Group, which aims to reduce its impact on the environment while offering guests a quality stay in Greece. Metaxas Group of Companies recently announced that it is planning a major hotel investment in the Mirabello Bay in the area of Kavousi, Eastern Crete. The authentic side of Crete will be introduced to 45 leading German tour operators, travel agents and journalists attending the 2018 FVW Workshop. UK tour operator Jet2holidays has honored the Creta Maris Beach Resort on Crete with the “Quality Award 2017” for the high-quality services it offers to guests. 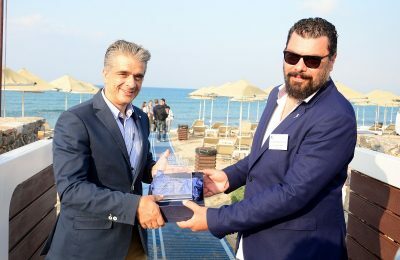 The Creta Maris Beach Resort on Crete has been honored as a “TUI Umwelt Champion 2018” and also received the “TUI Top Quality 2018” award by travel giant TUI. Maris Hotels has joined the “Clean up the Med” campaign and recently held a cleanup operation on the beaches located in front of its three hotels on Crete and Santorini. The Maris Hotels group has been honored for its social sensitivity practices during the annual HR Community Conference & Awards 2018. The Creta Maris Beach Resort on Crete has been honored by Apollo Travel with the “Gold Customers Choice Award 2017” for a third year. The Metaxas Group of Companies, owner of the Maris hotels, organized a corporate trip for its employees to Chania on Crete.